There are so many spray parks but which ones are toddler-friendly spray parks around Edmonton? The great thing about having kids is that they will let you know if they want to go and explore a place, and interested is measured on how long they want to stay and how many times they ask if you can ‘please just go back one more time‘. It’s a brand new spray park and it’s the perfect size for toddlers. Attached to it, is a sandbox that also has waterplay feature perfect for kids looking to explore and play. Make sure you bring something to sit on as well as an umbrella or something to make your own shade. There is tons of green space around the spray park. There is a water play area the perfect size for toddlers that is off to the side of the spray park area, but close enough to run back and forth too. The bathrooms are located very close to the spray park area making it extremely convenient. There is tons of green space for picnics too. This is a smaller park but a favourite for sure! A water feature is set up in the sand area as well as a little spray park area with features that are toddler height. There are some areas for shade, plus picnic tables to sit at. A small spray park perfect for little ones and a hidden gem, the spray park is right beside the park itself so kids can run back and forth. There is one shelter for shade plus lots of green space to sit. With different areas for different ages, little ones can explore an area just their size or check out the other areas too. There is also lots of green space to sit and watch the kids play. There is no arguing with the fact that this is an amazing spray park and great for all age. This is one of the only spray parks around that also have a climbing structure on the water area, and kids love it. There is also a little water stream area for little ones to play too. This is a big splash park but the toddler area is awesome and has many water features for little ones to explore, plus there is a large spray area to run around. The best thing about this park is that it’s fenced and there are bathrooms. 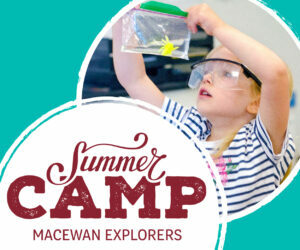 If you haven’t been you need to check it out because it will be a favourite for you and your little one. Located just outside of the Meadows Rec Centre this is the perfect place for little ones to run around and explore! Full of colour and a soft ground. There are also some picnic tables close by and a bathroom in the rec centre. Another park that is fun to explore, with a medieval theme. The park is fenced in, there is lots of green space and shaded areas, and the park is close by too. 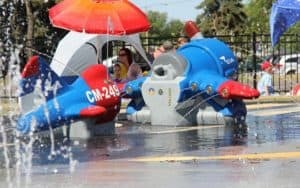 A great spray park for the little ones that love planes! Make sure you bring something to sit on and also your own shade as this is a newer park too! 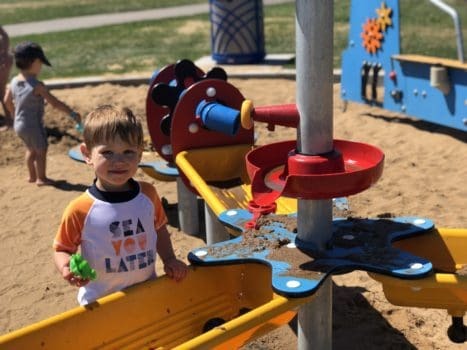 What are some of your favourite toddler-friendly pray parks around Edmonton? Are there some that aren’t listed here? Comment below and let me know where they are so we can explore!